Flour Mayhem: Ghost Cupcakes & a Giveaway! 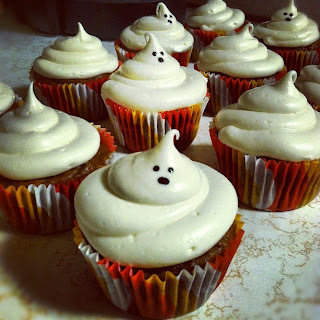 Ghost Cupcakes & a Giveaway! Fall is here, and it's looking mighty fine outside. My daily walks have returned to being filled with color, cool breezes, and leaves falling around me. It never fails, every time I walk under a tree and a few leaves drop around me, I stand a while and just bask in the moment. Sounds kinda lame, but it's completely true. I'm a nerd. This past weekend, I baked some pumpkin pie cupcakes to take to a friends house as an after dinner treat. Since Halloween is approaching, I thought it would be fun (and festive!) to add little ghost faces to the frosting. It turned out super cute, and I loved them. My favorite part about fall is Halloween! I love the cooler weather, but I cant help but love Halloween the most for it's awesome decorations, getting to dress up in costumes, and an excuse to eat and drink pumpkin everything! I love those ghost cupcakes! So precious! How can I choose just one thing about Fall? Maybe the cooler weather? With cooler weather comes the thought of snow, scarves, layers, brisk walks... all wonderful things. Favorite thing about fall is the sweatshirt weather and 101 different pumpkin flavor goodies! leaves changing colors, crisp morning air, decorations, the nights coming earlier and bundling up for late night walks. i love everything! lol oh, and PUMPKIN ERRYTHANG! I love the baking! Can't do to well but I try! And I'm gonna try to make your ghost cupcakes too! It's the start of the holiday season, love spending time with my family. Can't beat the gorgeous weather either. First off, I just want to say how cute your blog is. I love the way you write. It is refreshing and makes baking sound so easy and fun! Which usually baking scares me, so I applaud you. I can't wait to make the carrot muffins, those look so good and my husband and girls would love them! I am more a winter girl, but I do like the cooler weather, summer is just too hot here, and the changing colors like you mentioned is pretty nice too. Thanks ! I like the decorations, and the greatest holiday ever HALLOWEEN! all the good things you make!